The poorest Americans are stringing together multiple high-interest loans each year just to keep the lights on and food on the table, according to a new report from the Pew Charitable Trusts. According to the report, 7 out of 10 borrowers use payday loans -- typically short-term, high-interest cash advances -- to make payments on recurring bills, including utilities, car payments, food, rent and mortgage payments. This is contrary to the typical marketing from payday lenders, who often pitch the loans as quick cash for a onetime cash crunch. The report's release comes as other financial woes, like high unemployment and rising household costs, continue to put economic pressure on many consumers. There are signs that other kinds of high-cost borrowing, like use of credit cards, are also being increasingly tapped to pay for everyday items as well. Pew's report, released on Wednesday, also provides support for the Consumer Financial Protection Bureau, which plans to create a national policy for the payday loan industry. Currently the industry is regulated on a state-by-state basis. The report surveyed more than 33,000 adults, examining who uses such loans and for what purpose. According to the report's demographic data, the typical borrower tends to be 25 to 49 years old and has a household income below $40,000. Those making from $15,000 to $25,000 are most likely to use payday loans. Just more than 5 percent of Americans -- about 12 million people -- have used a payday loan in the past year, the report said. Pew's survey also revealed just how the fees and interest payments can add up to be astronomical. On average, borrowers shelled out nearly $900, including interest, fees and principal, for a loan of $375. These figures indicate how much borrowing costs balloon when a customer cannot pay off an initial loan in a lump sum. Instead, many borrowers renew a single loan multiple times -- and that can lead to five months of debt on average, the report said. The structure and costs of these small-dollar loans vary widely from lender to lender and from state to state, with interest rates ranging from those similar to what's charged for credit card borrowing (about 15 percent) to the equivalent of more than 400 percent. Twenty-eight states allow storefront payday lenders, while 14 states and Washington, D.C., have restrictions on the loan shops. Eight states allow storefront lenders but have stricter guidelines for fees and interest rates. Twenty years ago, storefront lenders were few and far between. By 2003, there were about 3,000 storefront lenders, according to one report. Pew reports that today more than 20,000 storefront lenders -- along with hundreds of online outfits and increasingly banks and credit unions -- offer these types of high-interest loans. They have become so prevalent that some major metropolitan cities, including San Jose, Calif., have taken steps to restrict the number of storefront lenders. Consumer advocates are highly critical of the payday lending industry because its profits rely on the extension of loans for a fee, which means there is little incentive for lenders to help desperate borrowers trying to climb out of debt. 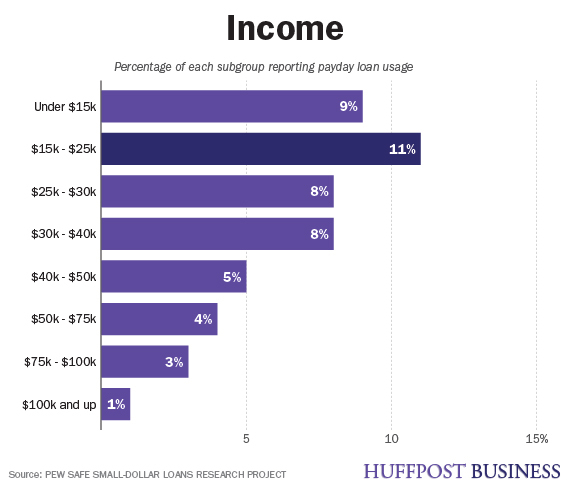 See a chart showing the income distribution of payday loan customers.